1920s ‘I Want You To Love Me’ postcard. Private Collection. 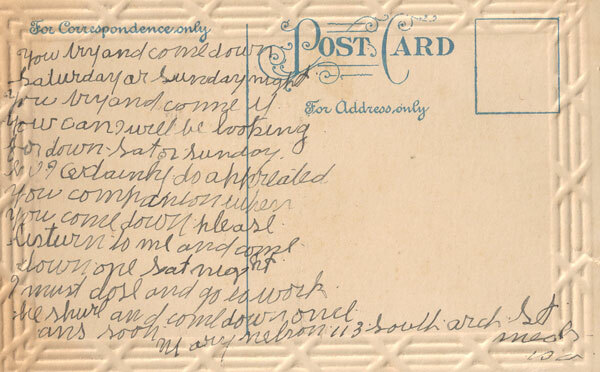 A sweet American postcard with an even sweeter, insistent missive written on the back. The poor boy had it bad for ‘Mary Nelson’. The message was clear by his choice of postcard, and even clearer by the one-track message on the back. He lost his head and kept on repeating himself, wanting very much to see the object of his infatuation on Saturday or Sunday night. This entry was posted on Tuesday, May 26th, 2015 at 6:50 pm	and tagged with embrace, evening wear, white gloves and posted in Couples, Postcards. You can follow any responses to this entry through the RSS 2.0 feed.